Rent the excellent Ground Heater Rental E3000 from the Duke Company to keep your crew warm, productive and working through-out the Winter. Call 585-292-9870 (Rochester NY) or 607-347-4455 (Ithaca NY) to rent a Ground Heater with best-in-class heating capability. The Wacker E3000 Ground Heater Rental is widely respected by pro contractors for ease of operability and dependability. Precision engineered for consistent heat delivery results in powerful thawing and curing capabilities. Equipped with one pump per hose loop resulting in substantial Btus of heat per hour being delivered to your project. 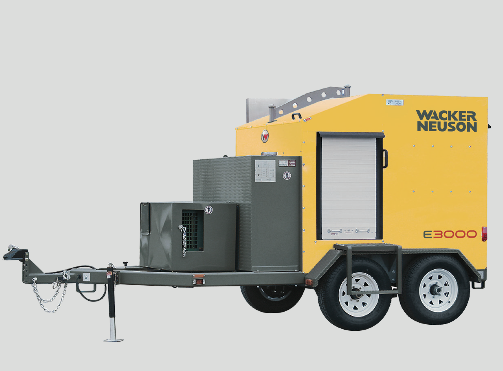 If you need to heat or cure up to 6,000 sure feet, the Ground Heater Rental – E3000, manufactured by industry-leader, Wacker-Neuson, is the perfect equipment rental heater for your crew. Run time = 140 hours. Hose Length = 3,000 feet. For excellent service & expert advice from the Duke Company, call 585-292-9870 (Rochester) or 607-347-4455 (Ithaca NY). Please note, as a leading rental company, we often rotate our inventory Ground Heaters and will provide you with the best available Ground Heaters and equipment. While we will make every attempt to provide you with exact makes and models, not all products are always available at each store.